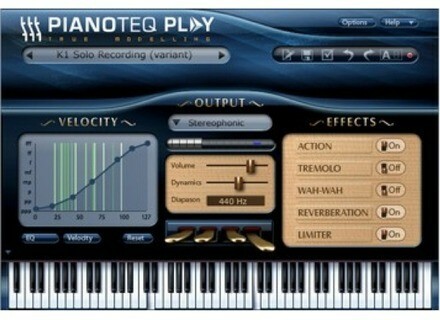 Pianoteq Play, Virtual Acoustic Piano from Modartt. 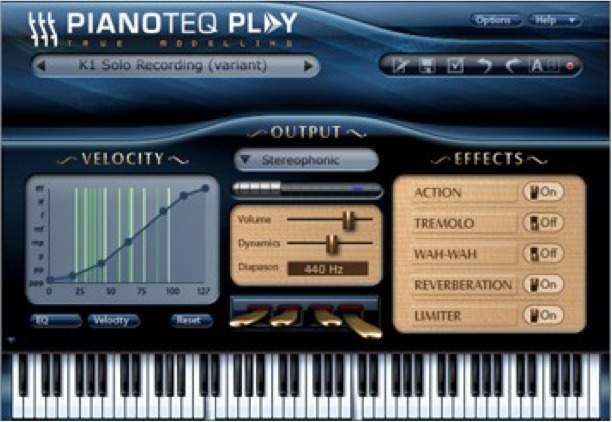 Pianoteq Play is a virtual piano based on the physically modeled Pianoteq software instrument, appraised by many musicians for its close intimacy and responsiveness. Modarrt says there is no need to tweak settings and parameters, as Pianoteq Play is delivered with "perfectly designed instruments." Pianoteq Play supports all Pianoteq instruments, and the grand pianos K1, C3, and M3 are embedded. The free add-on KIViR offers a unique collection of historical instruments: cimbalom, harpsichords, pianoforte, early pianos, CP80 electric piano. Pianoteq Play users can at any time upgrade to any of the other Pianoteq products to gain further sophisticated features, such as to tweak the physical model or to position virtual microphones around the instrument. It supports all Pianoteq add-ons, and if you upgrade to Pianoteq (standard) or Pianoteq Pro, the add-ons themselves upgrade automatically at no additional cost. You can listen & download the trial version and introduction video at www.pianoteq.com on June 1. 7 Pro Rec Sound Banks for Korg M50 Pro-Rec has released seven brand new banks of sounds for the Korg M50 for a total of seven sound banks available for your Korg M50. Loopmasters Vintage Breakbeats These samples are taken from ISR's Vintage Breaks Volume One. 112db Updates Redline Reverb 112dB announced that their reverb plugin Redline Reverb has been updated to version 1.0.2, a maintenance release which applies to both the retail and the demo version.